California Watch relies on an aggressive distribution model. The biggest shift in Bay Area journalism in years came not suddenly — with champagne and crying, or, alternatively, with quickly emptied desks and a different kind of crying — but in something like slow motion, whispers building to rumors building to point-blank questions, and, finally, press releases and official paperwork. 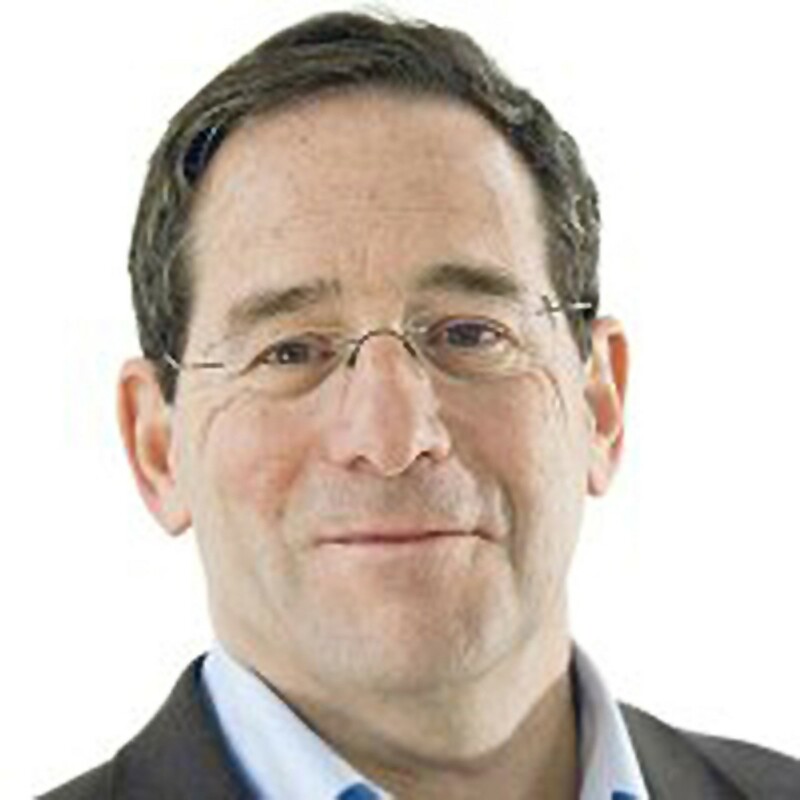 After months of speculation, first internal and then external, the nonprofit news organization The Bay Citizen — roiled by the resignations of its editor-in-chief, Jonathan Weber, and its CEO, Lisa Frazier, in the fall, and then the death of its founder and primary benefactor, Warren Hellman, in December — officially announced in March that it would be merging with Berkeley's Center for Investigative Reporting, effective May 1. And just like that, one of the most promising young journalism outlets in the Bay Area became part of one of the most respected news organizations in the country, and the East Bay became home to the biggest investigative journalism nonprofit in the nation. Local papers and national media blogs alike ignited with the news, and for good reason: This was big. 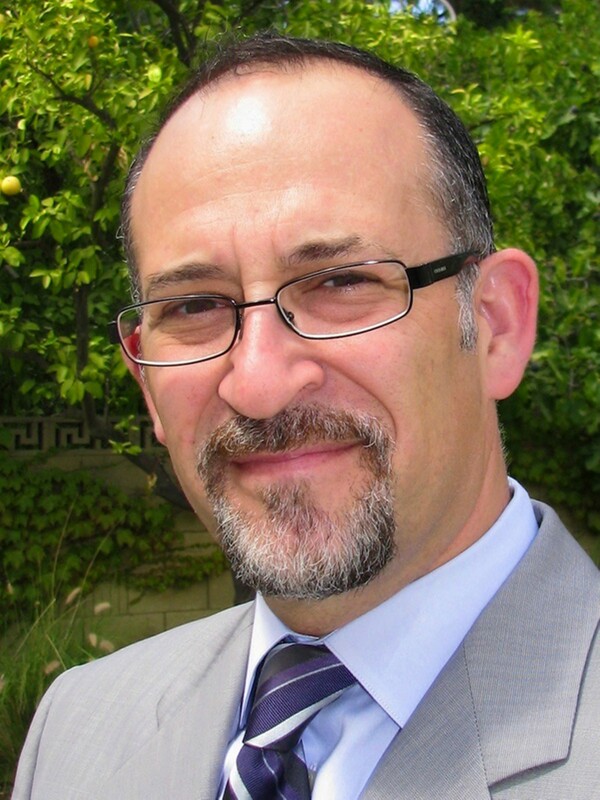 In an era when newspapers are shrinking, the new CIR would be working with a comparatively massive $10.5 million operating budget and a staff of seventy people — up from just seven when Robert Rosenthal, the director of CIR, came on in January 2008. 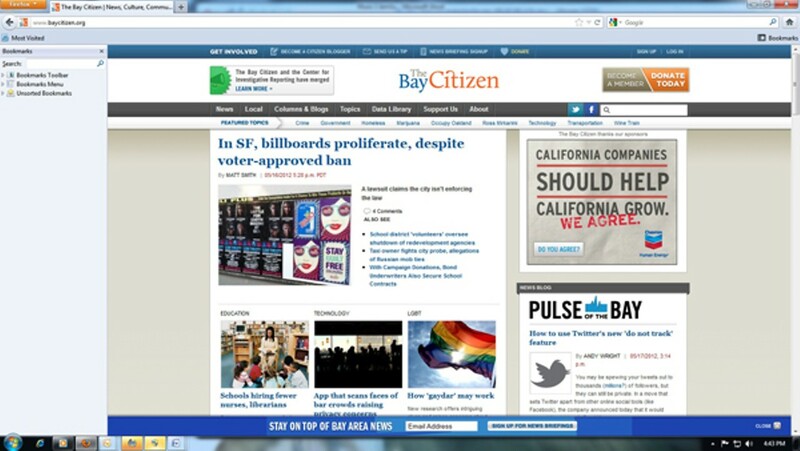 The idea, according to Rosenthal, was to make the new Bay Citizen something of a local analogue to CIR's already existing (and highly lauded) California Watch project — the smallest of three geographically specific concentric circles, with The Bay Citizen focusing on the Bay Area, California Watch continuing to cover statewide issues, and the Center for Investigative Reporting working on stories of national and international import. All three brands would — and now do — fall under the CIR umbrella and leadership structure, and focus on investigative and "solutions-based" journalism rather than breaking news and culture reporting. The Bay Citizen and California Watch/CIR are still working out of their old office spaces on opposite sides of the bay, but when they find a new building, all seventy employees will be working together under one roof. It's a big change, to be sure, but it's not necessarily new, nor is it confined to the Bay Area: In fact, this merger is but the biggest and latest example of a tectonic shift that's been underway for years now, as newspapers continue to founder and as nonprofit news organizations increasingly come to fill the holes left by layoffs and cutbacks. Perhaps the best-known — save for the new CIR, maybe — is ProPublica, which made headlines in 2010 when its 13,000-word investigation into malpractice at a hospital in post-Katrina New Orleans, published in the New York Times Magazine just two years after the news organization's founding, won both a National Magazine Award and a Pulitzer Prize — the first ever for a nonprofit news organization. Since then, it's gobbled up another Pulitzer — that time, the first such prize awarded to stories that never appeared in print — as well as a handful of other major awards, and has come to be heralded as something of a silver bullet for an ailing industry. As Gerry Marzorati, then the editor of the Times Magazine said in his Magazine Award acceptance speech, "a lot of [newspapers] are going to look at places like ProPublica" for support moving forward. And they have. In the last three years, nonprofit news organizations — and traditional-media's reliance on them — have exploded. According to data from Harvard University's Hauser Center for Nonprofit Organizations, there are now dozens of journalism nonprofits operating in the United States. Some, like the Associated Press, Harper's, and San Francisco's Mother Jones magazine, have been operating for decades (the former two for more than a century, in fact), but just as many have been founded in the last ten years. Many — like, again, Harper's and Mother Jones — operate with the same distribution model as a for-profit publication, but an increasing number are using a system more like that of the Associated Press: That is, they have no means of distribution of their own, but rather create content which is then sold or given away to other publications, like what ProPublica did with its Times Magazine piece. 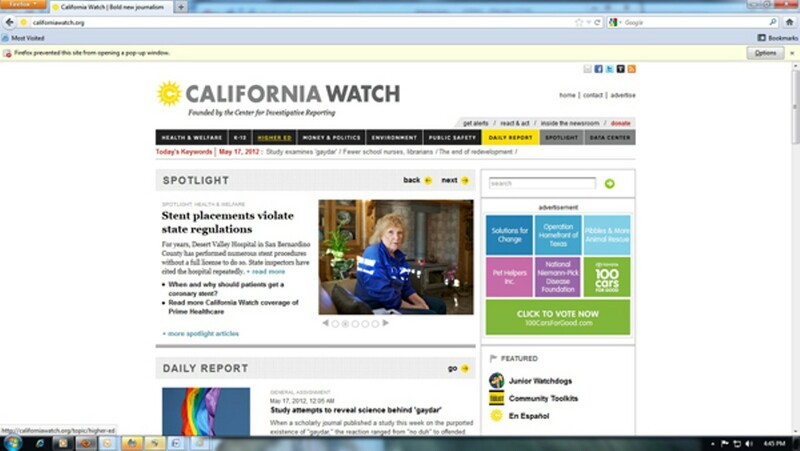 This is the model that CIR, California Watch, and now, the Bay Citizen, tend to use; according to its website, California Watch has partnered with or provided content to seventy local papers up and down the state, including the Express. In many ways, it's a good setup for everyone. When the one-two punch of the Internet and the recession hit newspapers, the cuts were deep, devastating, and almost universal. But a nonprofit news organization like California Watch or ProPublica, shored up by foundation money and freed of the overhead costs associated with hiring ad-sales and circulation staff, is now taking on the work left undone by newspapers — and, in many ways, doing it more effectively. At the same time, though, it's dangerous for newspapers to rely too heavily on content supplied by outside sources, especially when it's cheaper than bolstering one's own staff. While champions of news nonprofits argue that they're simply fixing an existing deficit in the mainstream news world, it's also clear that their very existence depends on that deficit. In order to justify itself as an ancillary investigative unit for a publication like the San Francisco Chronicle, CIR has to ensure that the Chronicle needs that service. Thus, it's in CIR's best interest that the Chron buy content from an outside supplier, rather than save the money to hire a reporter.